Even though most of us keep our shopping lists, notes, phone numbers and other vital information in our phones these days, there are still times when we find ourselves scrawling some info on our palms. 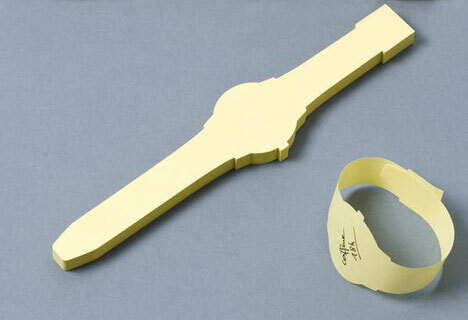 For those times, these awesome watch-shaped Post-it notes could be all kinds of useful. The little yellow strips of paper are shaped just like wrist watches and feature a single point of gummy adhesive to hold them together on your wrist. They stick usefully right where you can see them, letting you scrawl all you want without marring your skin with ugly ink marks. See more in Industrial Design or under Technology. October, 2011.